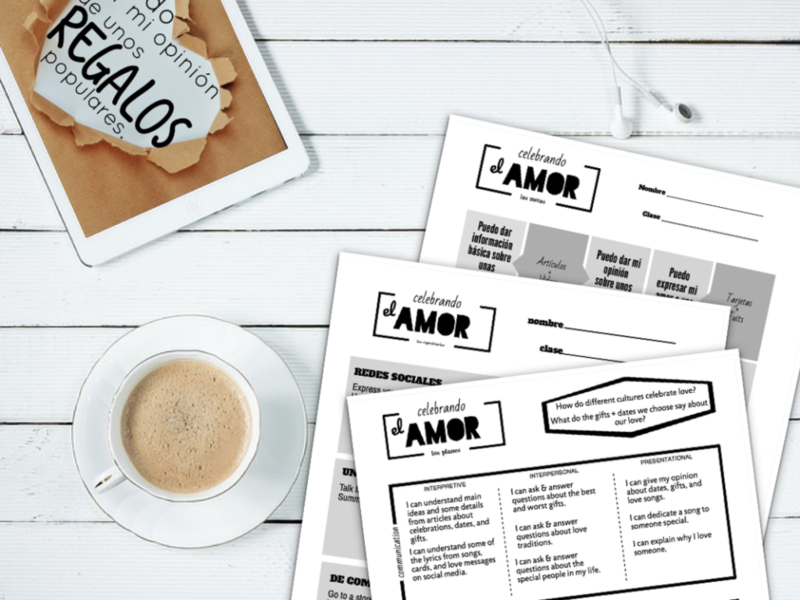 The number one way I increased student motivation was to replace the textbook worksheets with authentic resources. They are real, and my students connected to them. In our next few posts, we are going to explain how we have let AuthRes TAKE THE LEAD in all aspects of a unit (we’ll use St. V Day as an example). The 1st Step is UNIT DESIGN. At first I constantly had the problem that I couldn’t find an authentic resources that fit my unit topic. Family, clothing, places in the city, imperfect vs. preterite, subjunctive. Look familiar?? Then I realized THAT was the problem, not the AuthRes search. 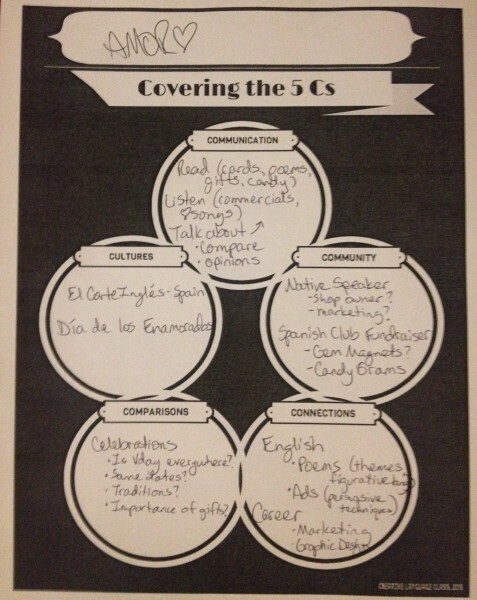 These unit topics were limiting in so many ways… They were mostly vocabulary lists or grammar topics. No communication focus. Nor culture! When I found a good AuthRes, I quickly learned that it could lead the entire design of the unit. About 3 years ago, my district pushed us to add Essential Questions which proved to be even more powerful. Sara-Elizabeth has some great essential questions examples on her Musicuentos site. Another unit example was one about music. I found it to be never-ending and couldn’t find the resources for what I thought I needed. Then I realized I could connect it to a specific Hispanic music awards show and BOOM! So many AuthRes like tweets, video clips, reviews, and webpages. All were very relevant and gave us something real to talk about. At the same time, I also like to pull out my 5 C’s planning sheet. It makes me think beyond culture and communication. The toughest one on here was the community. This one I’ll need to explore more. In the past we have made glass gems with magnets for lockers that have Spanish sayings like conversation hearts to sell for Spanish Club. The French Club sold CandyGrams one year. I’d love to bring in a guest native speaker. 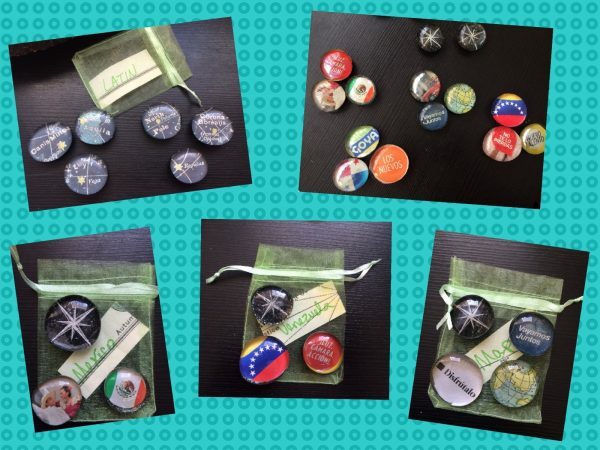 For example: someone that owns a little boutique with gifts or candy, or in the marketing field. Hmm. For the other C’s, we will show some of those examples in upcoming posts. Above: Some magnets I made using old magazines, a map and printing pics from Internet. So there’s the 1st Step❣ Design the unit around something cultural and relevant that they can talk about. 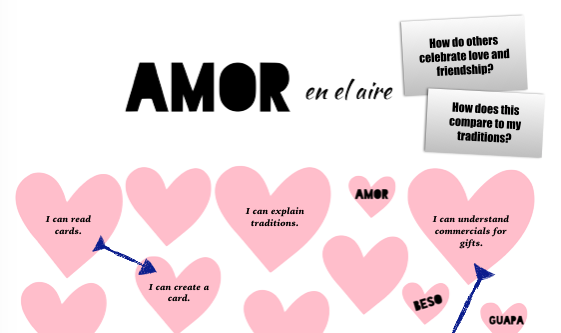 Note: These lessons (and a whole lot more) are included in the “Amor en el aire” unit on www.AdiosTextbook.com. Excuse my ignorance, but what exactly is Let AuthRes Take the Lead? For me it’s the idea that a real resource can guide what the unit will be about instead of a vocabulary or grammar topic. I love this! It’s the exact question I have been asking myself as I move further away from text books. What drives my scope and sequence? When I am setting up those essential questions, am I asking questions about the language or about a topic that is driven by something else? I have been more and more inclined to let the authres to lead the way, so it is so helpful to have this guide. Please keep them coming!! Will do! The topic can be driven by so many things like current events and what’s going on that they want to talk about. I love that you give students the I cans in the TL. It seems like there are a tons of cognates, but do you ever have issues with students understanding what they’re being asked to do? Do you go over the goal words explicitly? Thanks! I always want them to know our daily goal so I’ll do whatever it takes. At beginning of year/course, I put the goals in English for Novice Low students, but switch to TL as soon as I feel like we can. (I’m now debating if I should even do English at beginning). Also my daily routine is that I point to the goal on the board (in TL), say it, ask if they have questions before I start the lesson and when we finish. There are also little pictures next to the goals that help explain it (a book for reading, ear for listening, a mouth for speaking, and paper/pen for writing) and I’ll draw other pics if needed. Beyond cognates, they have learned so many words just from this routine, like reseña/review and anuncio/commercial. Just a quick question, (love this step by step info! ), I am interested in the gems also for my club. Are there instructions for making those…where did you get the awesome pics to go inside/behind the gems? Thank you! Hi Kristi! There are a ton of how-to videos: https://www.youtube.com/watch?v=iivSVePTqOk I used lots of different sources for the pics: from Spanish magazines, old maps/posters, print pics from internet, scrapbook paper, type on a Word doc or students drew them. Nail polish can be used too!